Discover Delicious: Emily's Home Sweet Home and help the O'Malleys fix up their dream house! After a warm welcome, some neighbors reveal a different nature. A turbulent time follows in which Emily and Patrick must go above and beyond to stop their house being condemned. A house is but a house, but can you help them make it home? Delicious: Emily's Home Sweet Home Collector's Edition is rated 4.9 out of 5 by 47. Rated 5 out of 5 by rquigl03 from Another Delicious Game I love the Delicious series and this one is no exception. Fun, challenging, interesting, and a great storyline combine to make this a fantastic time management game. There are some levels that are easier than others and some that are just plain difficult and will require multiple attempts to get through them. The visuals are what you'd expect from a Delicious series...not groundbreaking but cute. I love all the upgrades throughout the game and the storyline makes you want to continue playing to see what happens even though you know it'll be a happy ending. The Delicious series is one of the only ones (besides Jewel Match) that I will buy outright without even playing through the trial. They're always consistent and always fun. Rated 5 out of 5 by GoldieFish33 from More levels? You've got it! I've purchased all of the delicious games and my biggest dislike it that it felt like the game ended so soon! Home Sweet Home introduces bonus levels! Double the levels! Definitely worth the price not to mention the same great story line, amazing graphics, and sound! Keep up the great work! Thanks Bigfish for continuing to feature the Delicious Series! Rated 5 out of 5 by Hulagirlaa2 from Challenging and FUN! I have played all the Delicious games and was so glad that they made it here on BFG. Each level is challenging and I love the storyline. I haven't perfectly beat all the levels yet, but I keep trying! Rated 5 out of 5 by bubuus from Love it! There hasn't been a Delicious game I didn't love since the first one came out. I hardly ever buy games, but everytime a Delicious game comes out I'm the first to buy cause they're all amazing. And this one is no exeption. I started playing it and finished completely within a week. I just couldn't put it down. The only thing I'm not happy about is that now I'll have to wait ages for a new one to come out. Rated 5 out of 5 by keegan12 from Best Emily Game I love all the Emily games but this is my favorite. There's lots of different places to work and lots of products. There are two levels I swear you can't beat but other than that it's so fun. I have played it hours and hours. Rated 5 out of 5 by KoRnyMom from A new Delicious Emily game! I have played most of the series from another game club, and I'm thrilled that Big Fish is offering them now! I was really excited that a new chapter came out I wasn't even aware of! I really like the amount of levels, and different restaurants, and how the menu is laid out. The characters are interesting with the usual "love/hate" of a couple of them through out the story line. As you get achievements you get diamond points which allows you to fix and decorate Emily's new home. I also really enjoy how you can customize the menu each level and it rates the food letting you know if it gets you more money, or preps fast, and some won't even burn so you can prep them for a "Quick" bonus! The Delicious Emily series is exactly the type of Time Management/cooking game I love! I hope they keep on making more. I know her sister, Angela is coming out with a Fashion based TM game soon! Can't wait. Rated 5 out of 5 by BlueViola from A great addition to the series! Following the tradition of great fun and lots of laughs this game has continued to give me the enjoyment I so crave from this series. The characters are memorable and lovable and I hope to see a spin off soon! Maybe a flower shop or two? Hint, hint, nudge, nudge. Lots of achievements and collectibles. I thoroughly enjoyed this game and will be getting Childhood memories to complete my collection. Rated 5 out of 5 by Pishy from Loved it Got it on sale, worth every cent. . I beat the game in less than a week lol so I just started over, it's very re-playable. I just wish I was a little longer or maybe a tad harder. The game is very beautifully designed and I loved the story. Has 1 bug with trophies but didn't stop the game from being fun. I'm ok with not having the last trophy, the forum says the developers are working on the issue. Rated 5 out of 5 by Charleen from Delicious: Emily's Home Sweet Home Collector's Edition I want to thank BF for another Emily's game!! I love love Emily's games.. From the time she was little, her wedding, their honeymoon, the restaurants, and now building their dream home.. All of her family and friend Francois are back.. My favorites are new friends like the Evil Council Woman, Sun Lotus, Moon Blossom.. just to name a few You have to read the story line and help build Emily's dream home and watch Patrick make Emily's Restaurant into a reality! Oh and what ever you do watch the credits.. Everyone dancing is so Wow!!! Love love this game.. I hope they continue with the Emily series.. They are fantastic!! Big Fish Rocks again!! Rated 5 out of 5 by gprpsp from As always, Great You have to love these games involving Emily's family. A great story line to follow and interesting new people to meet. I look forward to every new game that involves this family. Rated 5 out of 5 by poohbearis25 from Loved It!! I have enjoyed this series!! Has good level changes. Great graphics. I had no issues or bugs. This storyline of games I find I play over and over again. Rated 5 out of 5 by syntheticB from Another wonderful Emily game! The newest installment if the series is so much fun. In my opinion the games get better and better. It provides just enough challenge and balances it well with relaxing music and graphics. However, it is the story that always makes Emily one of my favorite TM series. Rated 5 out of 5 by midnight381angel from Best Time Management Game-Best of her series I personally have all of the Delicious Emily games and love every one of them, but I believe this one to be the best of them all. The storyline is awesome, and found my self smiling and laughing at the interactions of the characters, along with wanting to see what would happen next. Not only do you have the chance to get the full three stars for completing each level, you also are trying to win a "diamond" for a "specific" goal within each level. The Diamonds are how you "fix up" Emily's new house; and of course you also need to collect the mouse on each level. In between regular levels there are bonus levels, again with a specific goal to get an extra diamond. Emily's menu can also be changed as you open new foods, each food helping in some way *more tip, speed of preparing, etc. * New characters, a room to decorate based on achievements. I really enjoyed every minute. Hope they continue with Delicious series, really fun and entertaining to play! Rated 5 out of 5 by vdunai1 from Delicious: Emily's Home Sweet Home Collector's Edition I own and have played all of the delicious Emily's games. This one is definitely the best. Rated 5 out of 5 by RaNuit from LOVE IT I own all the Delicious games offered here on Bigfish, I love all five that are offered and would love to see the others added into the fold just to have the complete set. Highly recommend all of the Delicious games, they are addictive and well done. Rated 5 out of 5 by trinity37373 from It's sooo Delicious! They are all sooo good. But this Delicious was awesome. You definitely have more play time. It was challenging to get all the stars and get all the furniture and meet all the goals. The story line as always is sweet.These games you can play over and over and never get bored. Great game and I wish other game makers would try to make more Time Management games. Rated 5 out of 5 by honest2 from LOVE THIS ! This is a fabulous game. I actually follow the story that goes along with these games too- a rarity for me, I don't usually bother too much. Some levels I have found pretty challenging and one level at the fairground ( where you cannot feed the children fried food or drinks) I still haven't mastered - after 7 tries ! May have to go to hints and tips page in the end. Overall delighted ! Rated 5 out of 5 by bikerstuff from Delicious: Emily's Home Sweet Home I love playing anything with Emily. Keep them coming. Rated 5 out of 5 by swanee22 from I confess: I am now officially a delicious addict!! I was so happy to finally get emily home sweet home..I have played it now at least a dozen times and still not getting bored with it. I now own every edition and love this one! I do find the challenges a little hard at times, but hopefully I will get better as I go. I highly recommend this game! Rated 5 out of 5 by Linca1 from LOVE IT 3 stages of difficulty is a plus, and the bonus objectives + mice catching on every level. On top of that you also got bonus levels you can do if you want and the renovation of the house. There are far between really good TM games, but this one is definitely a good one. AND it's a collector's edition. What's not to love?? Rated 5 out of 5 by SouthernGal820 from So glad BF now has Delicious I always had to buy these games from another site, so I'm so happy BF now has them! As with the others, this game is awesome. Has some new turns to it, you are not only upgrading your restaurants but helping Patrick and Emily bring their fixer upper up to code. Some of the challenges are a little hard to meet, the one where you have to serve 10 customers in a minute is VERY challenging but I finally did it. I had to let some customers build up at the beginning then start serving all of them. Once again, A GREAT GAME!!!! Rated 5 out of 5 by difficult1 from Emily Gets Better and Better This TM series is the best around imo. Just love it. More challenging and interesting each time. Brilliant. Rated 5 out of 5 by haiqal01 from Deliciously Made This game created by GameHouse & Blue Giraffe. 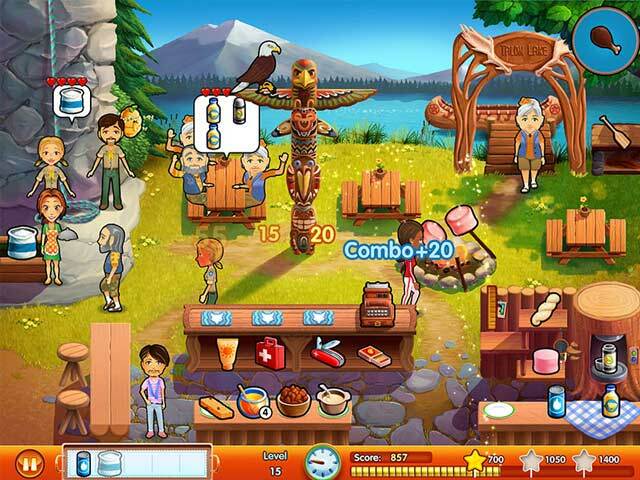 Delicious series have been a popular TM game , especially about running a restaurant or serving foods which is pretty rare right now. I like this series so much and Home Sweet Home is a great addition to the series with new characters , new gameplay , new story , and some other feature that catch my attention ! Home Sweet Home have features like Daily Challenges or Event like walking 100 yards and etc. I played all Delicious series and the older one did not have daily challenges but this one have it daily , it means every levels in the game! After complete it you’ll get 1 diamond which can be use to purchase furniture in the O’Malley’s house. Besides that , the game offer another feature about changing menu before start a level, there are variety of them and need to be unlock but it helps a lot as some of them can make you work faster or give more tips or both. Lastly , take pictures or memory and view them all in the house and another extra challenging level , again , to earn extra diamond! The gameplay is same but daily challenges and choosing menu can affect the gameplay or add a bit challenge. All you have to do is serve food based on customer orders , click the cash register , clean the table and send entertainer if needed to customers at the table. So it still the same but what makes it different is the setting in the game that have different features , activities , different stories and characters to meet. By the way you can still make combos to achieve expert goals. So overall , the game offer a classic gameplay with a touch of new features. You miss Carl the mouse? Yes he is in every levels and don’t forget to hunt him because he’ll give you money. And yeah the game provides you 3 difficulty modes too! The graphic in this game is delightful , bright , and colorful and crystal clear ! Meanwhile, the music is really good , I really liked it although every music in Delicious game sound the same or have same rhythm . Every audio aspects is perfect. I think you should know the story first , I don’t want to spoil but the story is still about the new growing family to build their dream house and there is always someone that try to stop them. So help them out so they have a Home Sweet Home. The Collector’s Edition includes Bonus Levels , Secret Mini Game , Wallpapers , Concept Arts , Emily’s House that contains Memorable Pictures , Achievements , and Furniture that can be purchase , and Extra Challenge Levels. Delicious Emily’s Home Sweet Home is going to be love by time management fans especially Delicious fans as everything is great. It is a great time management game of the year ! I recommended you try it first before buy. I also hope that this type of game will be more in the future because I did miss Diner Dash and other Dash series, I wish there will be more Emily games too ! Rated 5 out of 5 by AsiaMinor from Wonder what their bank thinks about all this....... So happy that another Delicious came out so soon!! This is the best time management game EVER!!!! Rated 5 out of 5 by Imberis from Great! This game is another wonderful addition to the Delicious series. 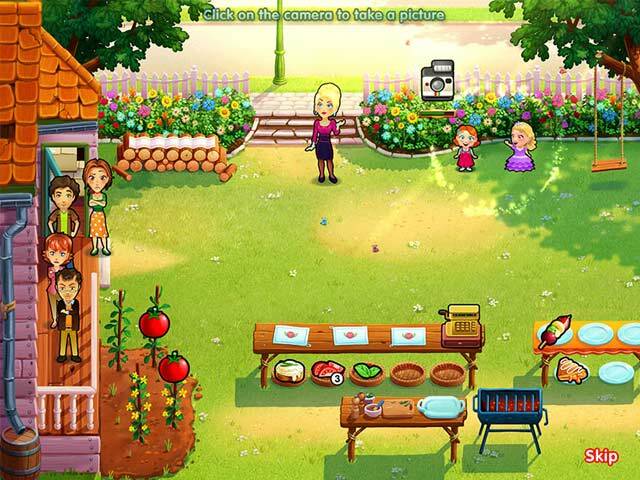 In this one, you play as Emily trying to fix up an old, larger home for her family. The Delicious games have a more in-depth story than most Time Management games, and this one is no different! The gameplay is mostly the same, with a few minor adjustments. Customers give you their order, you pick up or make items, deliver them, and take their money. Sometimes you have to also wash tables or entertain guests. There are three modes of gameplay, amounting to casual, advanced, and hard. New additions to the game: -- Unlockable foods: You must complete certain tasks to unlock new foods to have in your restaurant. Tasks mostly are things like serve ten snack foods, etc. to open up a new snack food. -- Challenge: Levels have diamond challenges, such as walking 100 yards or putting up decorations. Complete these and you get a diamond. That diamond is used for... -- The house! You can see the new house, and choose which items in the house to upgrade with your earned diamonds. -- (Spoiler alert, but important point all the same!) Paige's room also acts as the trophy room. Click on items in her room to see what you need to do to get the trophies. All in all, this is a nice addition to the Delicious series. It's fun, fast paced (but not too fast), and colorful. There are some new characters, too, which adds some interest to the story. Rated 5 out of 5 by Yaelle from So Good I Am Rebuying It! As with every single last game in this whole large series, Home Sweet Home is just too good to pass up. Well, whenever I cannot wait for Big Fish to get a game in this series, I end up purchasing it elsewhere - what is ending up happening is that I'm spending far over-budget to rebuy them as CEs from BFG because they're just so great!!! Also because I have been preferring as of late to have all of my eggs in one basket. After 9 years or so of collecting these PC & Mac games, my collection has grown exponentially & its easier to do it this way. Absolutely an excellent game all around. Characters, setting, gameplay itself, ALL of it - just great. Rated 5 out of 5 by pennmom36 from The O'Malley Dreamhouse Wow! Two Delicious games in one week! Emily and Patrick O'Malley just bought their dream house, unfortunately it's in need of some Tender Lovin' Care. All of our favorite characters have returned, baby Paige, Francois Em's BFF, Edward, Evelyn, Angela and Uncle Antonio, Em's family, as well as Patrick's family, Paddy, Brigid, and Kate. This is a Time Management game which can be played in Beginner, Normal or Advanced mode, and there is an available tutorial that will teach you everything you need to know to play the game successfully. This is a very easy game to learn, but it is fast paced, the good news is that there are 60 levels to practice on! Simply click on the items that the customer's want, (some items require combinations of items) click again on the customer to deliver the items, click on the cash register to accept payment and then on the table to clean up the mess. Each level has a mouse to find and click on that pops up randomly, you cannot achieve 3 stars on any level that you didn't click on the mouse, however, you can replay the level as often as you want to achieve a better score. New concession items are unlocked as you progress, and you can choose which items you want to offer, which I believe is a new feature. Whenever the camera icon appears, you can take a snapshot of that scene which is kept in Emily's scrapbook. You will earn Diamonds which can be used to upgrade and repair Patrick and Emily's dream house, one room at a time. 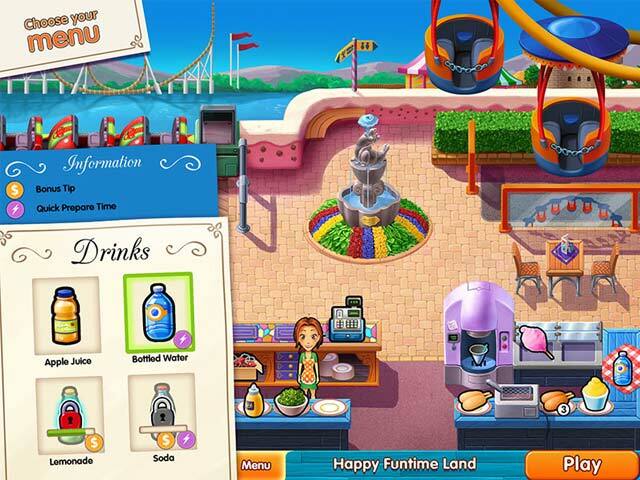 The money you earn from the concession's can be used to buy new equipment, add table and chairs, upgrade gardens, decorate, or add comfort items to keep customers patient and happy, or help Emily move prepare food quicker. Basically, you will make more money if the customers are served quickly, and multi tasking will earn more money as well. Between some levels, you can play a challenge level which is usually the level you just finished with the addition of finding several mice instead of one. This may sound easy, but those mice are everywhere, two or three at a time, and at the same time you have to take care of the customers! This Collector's Edition has 3 Wallpaper selections, 10 Concept Art pictures, and 10 Bonus Levels with a new restaurant, new events, a new story, and memorable moments, enjoy! Rated 5 out of 5 by bookwriter from The Best Emily Yet! Emily's story continues with the purchase of their new home/new restaurant and all the problems that entails. For me this is one of the best in the series as this has a little more challenges in the game play than usual. Every couple of episodes there is a special, unique challenge that you have to accomplish to get a jewel so you can place something in a room of their new home. You have to remember what your goal is which only adds to the fun. I would absolutely recommend this to anyone who loves interesting characters, a wonderful story line, fun sounds and great game play. This is a 10+++++ and the Best Emily Yet!! In Delicious: Emily's Home Sweet Home, you need to help the O'Malleys repair their dream house. Can you make it a real home? Hurry up, or it might be condemned!